Who else agrees that recess was one of the best things about elementary school? From the monkey bars to tether ball, it was all about getting outside, burning off some excess energy and having fun! Now that I work inside all day…plus some of the night, taking a ten minute break can be hard to come by – but even more important for staying healthy. 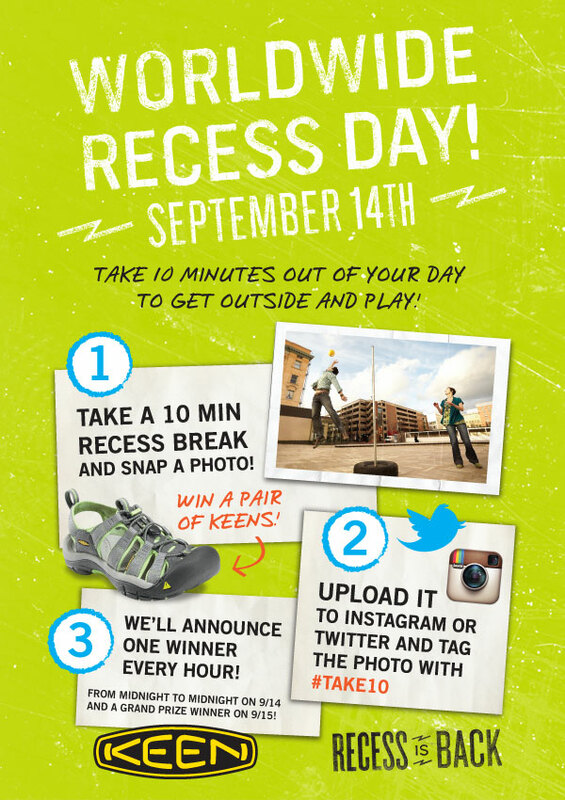 So as part of Keen’s Recess is Back program, I challenge you to take a 10 minute break on September 14th to get outside! Whether you walk to the Starbucks ten blocks away instead of the one around the corner or you go for a short run – or you could even play office hopscotch – just do something, anything…come’on its RECESS! So how about it? Who wants to play today?